People often say that leadership and management are two different things. This is true in one sense, but in another it isn’t. When I did my basic officer training in the military, we learned that leadership consists of two elements, inspiration and management. The main function of managing is to provide the structure needed to be efficient and effective. Without structure and a certain focus on tasks, we can meander aimlessly. Leaders who are poor managers can drive their followers to distraction by their inability to provide a proper framework within which to accomplish great thigns. To this we can add transformational or change competencies, as these are necessary for exercising leadership through time. I like to illustrate these relationships through the following diagram. 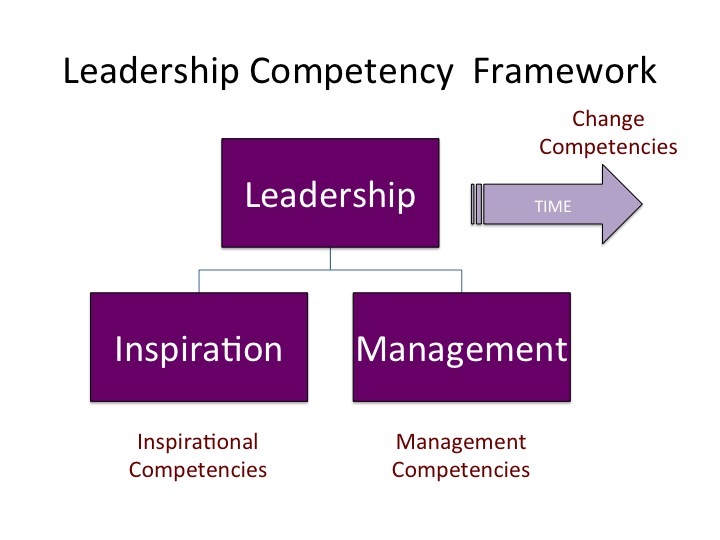 When we look at it through the lens of competency development, it leads to what I call the Leadership Competency Framework. This can apply at all levels and in all functional areas of an organization, whether strategic, operational, or tactical. I cover the development of management competencies that directly support leadership in detail in the first webinar of my Dynamic Leadership Online Course (details here).